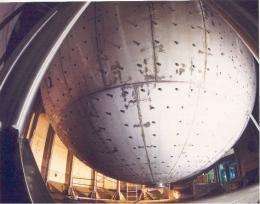 View of the Borexino "Stainless Steel Sphere" (SSS) from from the "Water Tank"
(PhysOrg.com) -- To learn more about how the sun works, scientists study particles that are emitted from it into space due to thermonuclear reactions that occur inside; by applying known physics principles, they can then deduce which sort of nuclear reactions are taking place. As one example, researchers have been able to identify high energy proton to proton interactions that are described as pp neutrinos by detecting them when they reach Earth. Now, researchers deep beneath the ground in a mountain in Italy, working together in a group known as the Borexino Collaboration, have spotted the more elusive proton to electron to proton neutrino, a pep reaction that results in the formation of deuterium, a heavy form of hydrogen. To detect them, the team, as they describe in their paper published in Physical Review Letters, the team had to develop a method of filtering out virtually all other neutrinos, including those from outer space. To detect the presence of neutrinos, researchers build underground facilities to use the Earths natural filtering abilities to remove particle clutter. Then, they fill a big vat with a special kind of liquid that reacts with the type of neutrino they are looking for. When one of the neutrinos strikes the liquid, a tiny flash or sparkle occurs. By measuring the number of sparkles that occur over a period of time the researchers can describe the amount of such neutrinos that are emitted by the sun, which helps to more fully understand the nuclear reactions that occur inside of it. Pp neutrinos have been easy to count, they are plentiful and high energy, which makes it easy to detect them when hitting the liquid. Pep, neutrinos on the other hand are low energy and more elusive and up till now have been mostly a theoretical concept. To detect their presence the team had to devise a means of filtering out virtually all other cosmic particles and then use a liquid that causes a sparkle when struck by a particle that has just 1.44 mega-electron-volts of energy, the distinctive signature of the pep neutrino. The team succeeded on both counts and were able to detect 3.1 pep neutrino strikes per day, per 100 tons of liquid. The new technique for cleaning and filtering out unwanted particles is ground breaking work and likely will be used by other scientists looking to measure other particles in other research efforts. We observed, for the first time, solar neutrinos in the 1.01.5 MeV energy range. We determined the rate of pep solar neutrino interactions in Borexino to be 3.1±0.6stat±0.3syst counts/(day·100 ton). Assuming the pep neutrino flux predicted by the standard solar model, we obtained a constraint on the CNO solar neutrino interaction rate of <7.9 counts/(day·100 ton) (95% C.L.). The absence of the solar neutrino signal is disfavored at 99.97% C.L., while the absence of the pep signal is disfavored at 98% C.L. The necessary sensitivity was achieved by adopting data analysis techniques for the rejection of cosmogenic 11C, the dominant background in the 12 MeV region. Assuming the Mikheyev-Smirnov-Wolfenstein large mixing angle solution to solar neutrino oscillations, these values correspond to solar neutrino fluxes of (1.6±0.3)×108 cm-2 s-1 and <7.7×108 cm-2 s-1 (95% C.L. ), respectively, in agreement with both the high and low metallicity standard solar models. These results represent the first direct evidence of the pep neutrino signal and the strongest constraint of the CNO solar neutrino flux to date. Probing Question: What is a neutrino?